Also known as "Capalaga" and "Ilachi," Cardamom is native to Southern India and cultivated elsewhere, most notably Guatemala. This large-leafed perennial member of the ginger family is harvested for its seedpods, which consists of three chambers that contain an aromatic, pungent seed. Cardamom seed is a staple seasoning in Indian and Middle Eastern cuisines, in which it is used to flavor meat, vegetables, baked goods, coffee and other beverages. Cardamom grows in a thick clump of up to 20 leafy shoots. It can reach a height of between 2 to almost 6 m. The leaves are dark green, long and sword-shaped. The underside is paler and may have a covering of tiny hairs. The flowers form on a long flowering stalk which can grow to more than 1 m long. They are both male and female and are pale green. One of the petals is white and streaked with violet. The fruit are pale green to yellow and elongated oval-shape. Each fruit has 3 chambers filled with small aromatic seeds, each about 3 mm long. The fruits and seeds dry to a straw-brown color. The word "cardamom" is derived from the Latin cardamomum, itself derived from the Greek kardamomon, which was derived from the name for a kind of an Indian spice plant. Cardamom is native to southeastern Asia from India south to Sri Lanka and east to Malaysia and western Indonesia, where it grows in tropical rainforests. Cardamom grows on the shady jungle floor of tropical rainforests, in cooler climates it is grown indoors as a houseplant. Prefers a rich, loamy, slightly acidic soil. For best results, fertilize or amend soil with minerals phosphorus and potassium. The smaller seeds should be sown in a light but rich soil buried approximately 1/8" beneath the surface of the soil. Cardamom requires a steady supply of moisture and will not tolerate drought. If growing in a greenhouse, it should be kept humid. Cardamom is not tolerant of cold and should be kept in a location with many hours of partial or indirect sunlight. 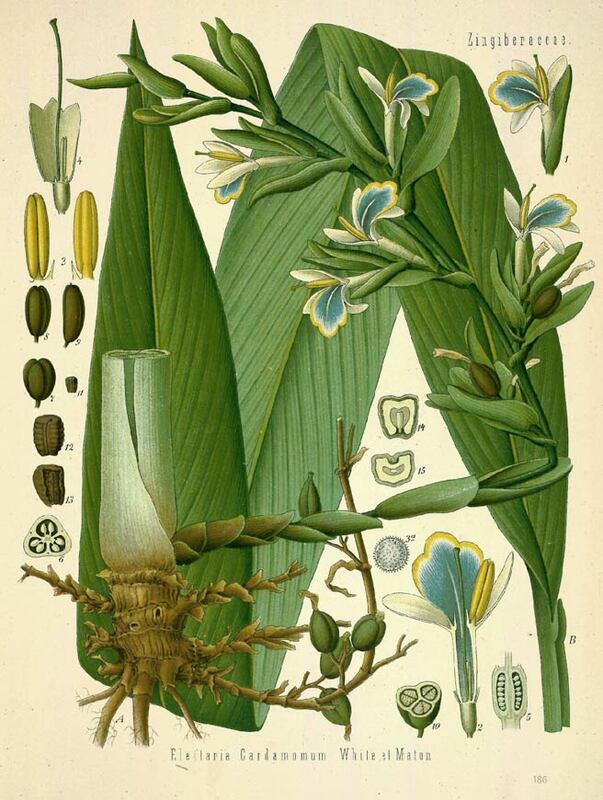 Cardamom requires approximately 3 years of growth to produce capsules containing seeds. 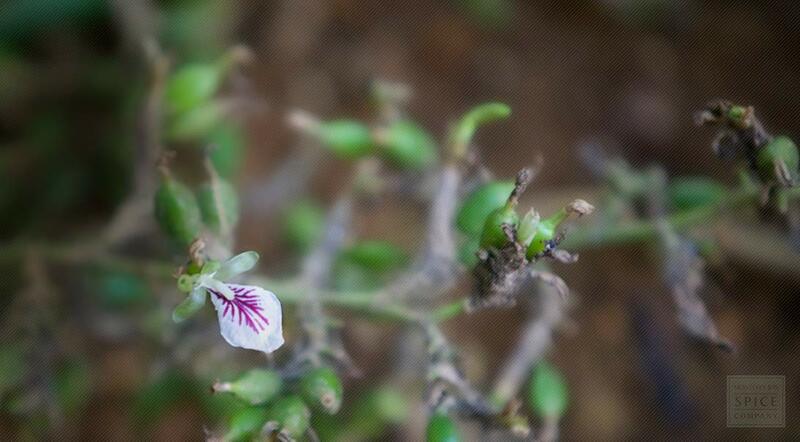 After the flowers mature, they will gradually dry out as capsule develops. These can be collected when capsules begin to turn green, and later dried on screens over the course of 6-7 days. Turn frequently. The seeds can be collected once pods are dry and easy to break open. Place pods into a bowl, and carefully thresh by applying light pressure to break up dried seed pod. Separate seed from chaff by winnowing with a small fan, or by placing into a medium screen and gently shaking back and forth while lightly pressing extraneous matter through. Store seeds in a sealed container in a dry, cool location out of direct sunlight. Cardamom is a member of the ginger family known for its unique	flavor and aroma, which can be described as smoky, floral, citrus	and sweet—all at the same time. Many traditional Indian dishes feature different varieties of cardamom. Elettaria, or green cardamom, is combined with condensed milk and sugar	to make sweets collectively referred to as mithai. Green cardamom is	also used to flavor coffee and teas, most notably Masala chai. Since culinary connoisseurs consider green cardamon the premium variety, it is commonly used to flavor meats, poultry, seafood, vegetable dishes, soups and sauces. In contrast, Amomum, or black cardamom, imparts a slightly mint-like flavor and is an ingredient in garam masala, a seasoning blend	used to flavor curries and rice dishes. Internally, you can take butcher's broom as a tonic. Usually, you just add a ½ ounce of the root to a cup of boiling water to make a tea. You can also make a tonic by boiling a few twigs in a large amount of water and allowing it to cool before drinking. Remove the twigs before you drink it, of course. Due to the cool sensation black cardamon leaves on the tongue, it is included in the formula for Eclipse Breeze, a breath-freshening gum produced by Wrigley. The spice is also a constituent in gahwa, a festive coffee blend that	has become recognized as a symbol of hospitality in Indian households. Should you find yourself fortunate enough to be offered this treat, be	aware that it is considered rude to refuse anything less than three	cups. Cardamom is a member of the ginger family known for its unique	flavor and aroma, which can be described as smoky, floral, citrus	and sweet—all at the same time. A native of India and Malaysia,	cardamom is harvested in October, and the whole pods are dried in	the sun or in curing houses and then sorted according to color. Common cardamom, or Elettaria cardamomum, ranges from green to	yellow-gray in color. The fruit of other species, however, may be	brown, black, red or even white. The flavor of all cardamoms is best	preserved when stored as whole pods since the seeds remain intact,	although the pods are also ground into a spice. You can also	purchase the seeds, which are sold as "decorticated cardamom."